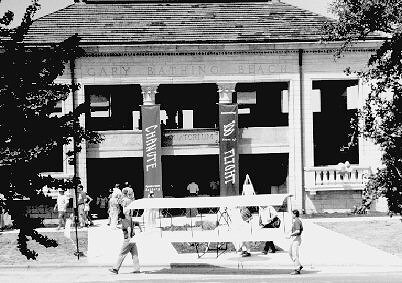 Marquette Park in Miller was the site of a celebration honoring Octave Chanute and his experiments in aeronautics of 100 years ago. Chanute-Aquatorium Society was joined by the National Landmark of Soaring in sponsoring this event. A National Landmark of Soaring plaque was dedicated at the Aquatorium, complimenting another such plaque dedicated nearby 60 years ago, not 500 yards from the spot that Chanute and his intrepid band of experimenters first began their 1896 experiments. Dr. Tom Crouch , of the Smithsonian National Air and Space Museum, spoke to the assembled crowd about the experiments, and then everyone trooped down the dunes to watch Paul Dees of Redmond, Washington attempt a flight with the replica he built. There just wasn't enough breeze that day, and neither his, nor the attempts of the engineering students of Rochester, New York, who had brought their replica, were successful. It didn't matter. The sight of those gliders, and the wonderful turnout, which included 3 generations of Octave Chanute's descendants, made for a great day! 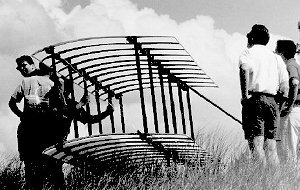 The students from the Rochester Institute of Technology contemplate another trial with their glider on the dunes of Miller Beach. Another page on the 1996 replicas in Miller. 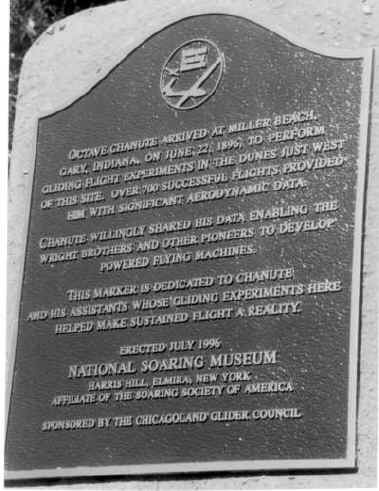 The Chicagoland Glider Council, an affiliate of the Soaring Society of America , provided this bronze plaque which was mounted in the entrance way of the Aquatorium. As soon as the refurbushing of the building is complete, the first floor of the building will serve as a Museum of Flight, specificly honoring Octave Chanute and the Tuskegee Airmen of World War II. The Chicagoland Glider Council also provided a static display of sailplanes and gliders, lLotsanding at about 3:30, with a batch of commemorative, specially stamped envelopes.